2017 / 1-25 June/ Why are the authors of the books I read so white, so male, so Eurocentric? 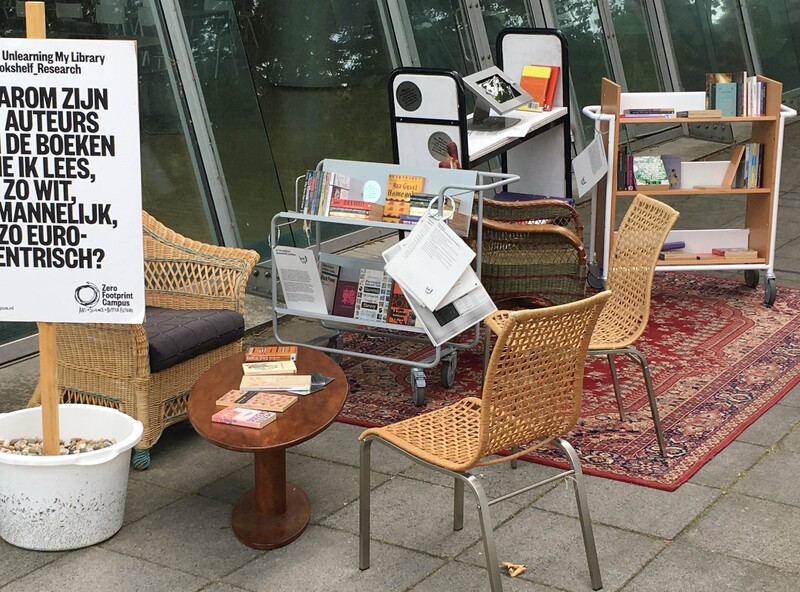 / Read-in at Zero Footprint Campus, Utrecht. The Into Circulation. Bookshelf_Trolley* includes a small compilation of books by our collaborators for the project Unlearning My Library to share references about forgotten, marginalized and silenced (her)stories. 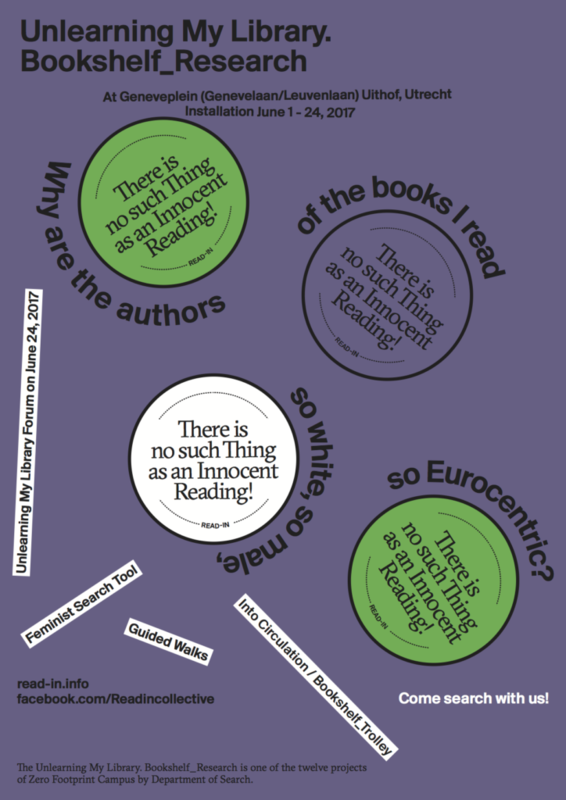 Throughout June, we extend our invitation to visitors of the public programme of the Zero Footprint Campus Project (June 1-24, 2017)** in form of an open call, to select books of their choice, responding to and intervening into the question: Why are the authors of the books I read, so white, so male, so Eurocentric? The underlying idea of the Into Circulation. Bookshelf_Trolley is inspired by libraries, mapping and archive projects such as “Kunci library” (Kunci Center for Cultural Studies Yogyakarta), “Mapping Slavery” (NL), Black Archives/New Urban Collective (Amsterdam), “Library of Requests” (Belinda Kazeem-Kaminski, Vienna), “Library of Omissions and Inclusions” (Eva Weinmeyr, Göteborg), “Grand Domestic Revolution Library” (Casco, Utrecht), Anarchist Library Vienna, Stichwort Archive Vienna, Chimurenga Library (Johannesburg, SA), Stuart Hall Library, London. These projects, on the one hand, use the format of a library to draw attention to silenced and marginalized voices excluded from our current knowledge economies. On the other hand, they use the library as a place and time to organize and mobilize against contemporary forms of oppression. In collaboration with Amsterdam-based programming&design&research collective Hackers & Designers, Read-in developed a Feminist Search Tool*,–a digital interface that invites users to explore different ways of engaging with the records of the Utrecht University Library, putting forth the question: Why are the authors of the books I read so white, so male, so Eurocentric? The tool has been developed in the context of the project Unlearning My Library. Bookshelf Research, and functions as an awareness-raising tool to stir conversations about the inclusion and exclusion mechanisms that are inherent to our current Western knowledge economy. To this end, the Feminist Search Tool invites us all to reflect about our own search inquiries, and how the latter may be directed by our own biases and omissions. More broadly, it raises the question about the different decisions taken that influence our searches: Who is taking responsibility for which part of the search process: we, the users, the researcher, the library, the algorithm? And how does this influence our search result? The Feminist Search Tool works with a search field, which we all can use to type in our search question. We then search within a selection of the records of the Utrecht University Library of works published in the period of 2006 till 2016. The selection is made by Read-in and is based on a number of MARC21** fields, that Read-in thought would speak to the question: How many female non-Western authors and female authors of colour are represented in the Catalogue of the Utrecht University library?, such as language of publication, place of publication, type of publisher, etc. Through an interpretation of these fields, Read-in aims to offer different filters, through which to look at the records of the Utrecht University library. **MARC21 (abbreviation for MAchine-Readable Cataloguing) is an international standard administered by the Library of Congress; it is a set of digital formats used to describe items that are catalogued in the context of a library, such as the university library Utrecht. For more information about the FeministSearchTool please check this post. The Unlearning my Library Forum took place near the Utrecht University Library Uithof to engage with alternative approaches to archiving, libraries, cataloguing systems and knowledge production. The forum was looking to create a platform that brings people together to discuss and exchange on different (artistic) practices, interventions and inquiries around (in)formal libraries, archives and their systems of categorization. For more information about the Forum Unlearning my Library and full list of participants please check this post.